Thomas joined the Post-Graduate Fellowship program at IHME in 2012 and worked on the Access, Bottlenecks, Costs, and Equity research team, a collaborative project with UNICEF to provide quality evidence for improving the equity and cost-effectiveness of health systems. As part of this project, he examined the cost-effectiveness of antiretroviral therapy in different countries, including his home country of Kenya. 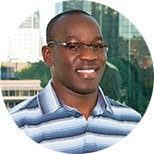 After IHME, Thomas went on to pursue a PhD with the University of Washington’s Department of Epidemiology and was an International Scholar in the International AIDS Research and Training Program. In addition, he went on to work as a Research Officer at the Center for Microbiology Research at the Kenya Medical Research Institute.